Half the time, I write about how old I’m getting. This is not one of those posts. When brewing beer – particularly at home – aging beer to that perfect moment is as inexact a science as one can find. That’s usually why I go with IPA’s and the like that need to be consumed ASAP for fear of them losing their hoppy bite. Even this truism with brewing IPA’s doesn’t always work. I brewed an IPA last year and it needed the extra month in the bottle before it really tasted good. Aging for pro brewers can be just as hard, but they have a lot more beer to work with, staff, meticulous notes, etc. My aging process is a crap-shoot. Luckily, it’s worked out well for me so far. I have three(!) such experiments in aging going on right now. This is strange for me as I rarely have more than one beer in secondary at a time. And even when I have, It’s been one beer is going in while the other is going out. However, for various reasons, I am sitting on three beers aging in secondary. The first is the one that’s been in for two months and may stay in for another 2-4. It’s my Belgian-syle Quad, better known as Guided By Voices. This beer, like all my beers lately has nailed both OG and FG. It was supposed to host some dried fruit, but I opted to let it age without so that the natural flavors would come out on its own. This beast is sitting at just under 11% ABV, easily my booziest effort yet. I don’t want to try it yet, preferring to be surprised, but it smells so good. Why am I waiting four or more months to try this beer? A friend suggested six and most of the bigger Belgian beers sit around for a long time. It will age as long as I feel like aging it. I don’t think it will hurt the flavor whenever I decide to open it. I can always age it some more in the bottle. Either way, I have boxes of 750-mL bottles just waiting to be filled with this thick, rich concoction. The other two beers – one a Saison and the other a scotch ale – are for a special occasion. My wife officially becomes an associate professor with tenure on September 1st. To celebrate, we’re throwing a party and I brewed these beers for the event. The Saison is a crowd-pleaser and the scotch ale is for her as it is one of the few styles she enjoys. I’m hoping that I timed both beers to be ready by the 1st. Right now, they both sit in secondary vessels, awaiting their bottled homes. The Saison is a repeat with a few minor tweaks. First of all, I forgot to include honey. It was nowhere on the recipe for some odd reason. Also, I used the wrong caramel malt (80L opposed to 20L). It’s a long story as to why the mix-up happened, but the beer actually didn’t start out as dark as the last time. Finally, I actually got the yeast to cooperate this time around. The first time, I used a smack-pack that just didn’t really take off. It was in dire need of a starter. Since I’ve had so much luck with dry yeast packets. I just threw in an entire pack and mixed it with my aeration wand. FG was achieved in small part due to my patience but in large part due to the extra warmth I added with a warming belt. In the secondary, the Saison is sharing space with some additional Sorachi Ace hops and Rosemary. I’m hoping that this will make the beer a bit more fragrant. It should at least make it good for beer can chicken. The scotch ale was a complete experiment. I’m not even sure if it truly matched the recipe I wrote. Still, it fermented just fine. I’m a bit worried that an American yeast in a Scottish beer will not show the character a scotch ale should demonstrate. So, I added some oak chips soaked in cheap scotch whiskey for a little depth. Ideally, this beer would sit for two months on the chips, but I don’t have that long. Six weeks will have to do. The second beer is called “Tenured Dingo”, a tribute to my wife whose last name is the same as the baby-eating, Australian dog. At best, the beer will be rich with flavor and really wow our guests. At worst, the beer’s namesake will tell that it would be good with a burger, something she says about every beer, regardless of style. Aging happens in other ways. As my hair grays, my record and beer collections age along with these homebrews. As change happens in my life (wife’s mentioned tenure, a new job for me), change will occur in those carboys. I’ll do my best to keep you all updated on developments as they happen, but as you probably can tell, keeping a blog up-to-date is not always an easy thing to do. Happy belated anniversary, and congrats to your wife on gaining tenure! 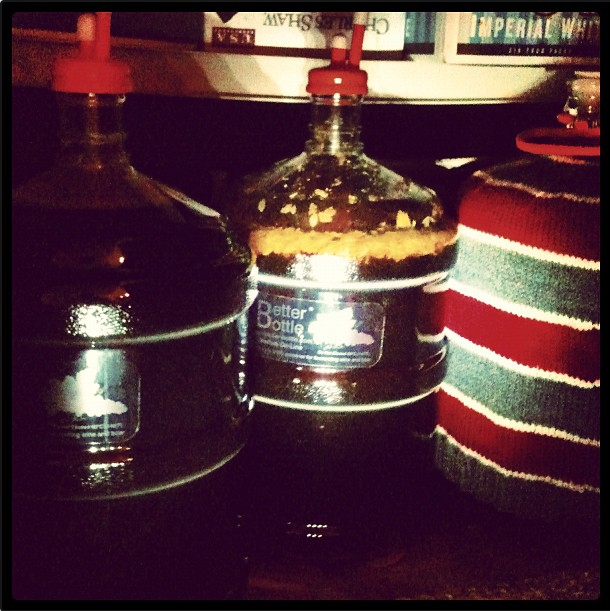 For me, every homebrew is a surprise — even re-brewing to a recipe i’ve used before is always a crapshoot. And I’m an extract/partial-mash brewer — I can mash small amounts of grains, but don’t have the ability to do a full mash. But I can’t count on the temperature where I ferment and condition to stay consistent, so… every beer’s a surprise, and so far, they’ve all been good surprises. We are kindred brewers, you and me, Bill. Your brewing techniques sound like mine. I also give away way too much beer. I justify the money I spend on ingredients as a money-saver, but I just give most of it away. The party in September will just be a giant homebrew free-for-all. I really need to buy Stan’s book. I love my Saison and the Quad is setting up to be a game-changer. Now that I have some experience, I need some knowledge. 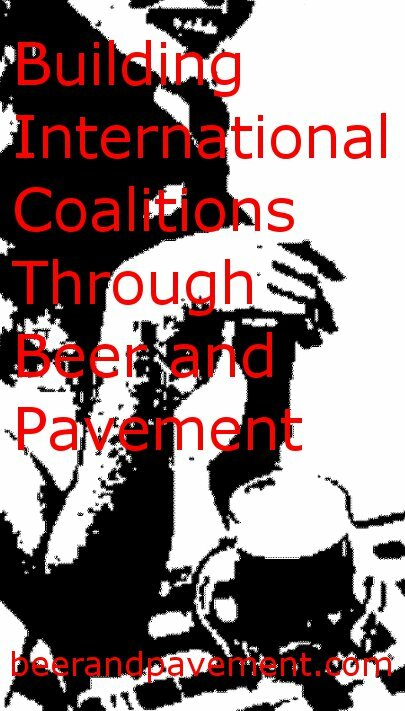 Naming an 11% beer “Guided by Voices”? Unbeatable. Naming ANY beer “Tenured Dingo”? Truly inspired. Thanks. I should bottle that GBV soon.